This item will be released as the rare loot from the WoW TCG Expansion "War of the Ancients". The official release date is October 2nd 2012. Mount automatically adjusts speed to your highest flying/land riding skill. Latest information and screenshots can be found at http://www.wowtcgloot.com/feldrake.htm. Here is a video of the new Feldrake. It appears that as of patch 4.3.3 this item has the highest ID# in the database. I can't imagine the envy of other players when they see a level 20 riding this. Feldrake? is this the drake too Fel Reaver? I bet someone would pay a lot for this mount, especially to get it as soon as possible, before the set is even released. I got a code for the Feldrake, and I can register it in September, so assuming the release date is still November, I can get the mount before it's even made public. http://youtu.be/zTM-GOPvLCc is a video of it in action. It does look pretty awesome. This would appear to be the first drake mount which can be used as a 'land only' mount. While level 85, I was able to ride it in Pandaria. Instead of flying, the drake jumps. Just saw one today, Very nice mount! A few things of note about this mount, which I recently obtained. - Above the head you can see an unusual green symbol, (which Morgaledh informs me is the mark of the Burning Legion! ), that floats just above the creatures brow. I submitted a screenshot, showing this glyphic mark. - The creatures feet are surrounded in green vapour which leaves a trail of green smoke and embers when you move. Very cool. - The bright, fluorescent green adorning the edge of the wings, claws and horns really looks engorged in fel and is very eye catching, and the shading around the stomach where the scales meet the belly is beautifully done. - Its accountwide, so your low levels can ride it at 20. I've submitted a few screenshots for in detail looks. Just found this bad boy on the AH for an insane amount so I talked to the seller & traded both Blazing Hippogryph+X-51 Nether-Rocket for it. A great deal in my opinion being that I got each for 80,000g, making this one cost me a straight 160k. The comments praising this mount on wowhead don't give it enough justice - it is AWESOME. Be prepared to get whispers in every area you're on it - most of all battlegrounds. Color modifiers such as Disgusting Oozeling, Kang's Bindstone, or Shadowform really show on this like no other mount, as the glow around the feet & head stay to add to the effects. I like that it doesnt roar as loud as the other drake mounts when summoned. Makes it both easy on the eyes and the ears! This drake is so much better than I expected - it looks a lot more amazing once you're actually able to see it for yourself. I just got it the other day and couldn't be happier. Definetly one of my favorite mounts; I just love the glowing claws and eyes... and the fact my level 20s can use it, AND I can use it in BGs and other no fly zones is just a plus. The Feldrake is such a stunning mount I made an account to comment on it! As it's been said, this is the ONLY dragon that acts as a land mount, meaning it can be mounted in Silvermoon, Battleground, and Dungeons and Raids that permit mounting. Something I didn't know when I had at first purchased it. I was feeling a bit of buyer's remorse at first when I first noticed the icon on my toolbar wasn't blacked out in the Firelands raid. It's also account-wide and mountable by your level 20 aspiring dragon rider. This mount is worth every penny if you're as terribly vain as I am. You WILL get stopped and asked about it in towns constantly. You'll get many, many compliments, and maybe a few death threats. Edit: As of 5.4 this has been stealth fixed to only function as a flying mount as normal drakes do. This was a very sneaky move on Blizzards part, and a whole year after the mount's release they are now deeming it worth 'fixing'. I suggest if you're as distraught as I am over this blatant subterfuge, make yourself known on the bugfix thread on the official forums. This mount can be summon on battlegrounds and arenas! Sweet! Picked up one last night for a great deal. It's probably based on the same platform as Hippogryphs and Gryphons, unlike every other drake. It makes the same noise as the birds when you summon it, but otherwise all the movements and other sounds are the same as drakes. I'd been lusting after this for months, didn't think I'd be able to get one! Probably the coolest looking drake out there. As a warlock this the MUST have mount, seriously how can you not love this mount? This is the kind of mount I wouldn't mind working for, if only it where achievable in-game. MAN I REALLY WANT THIS DRAKE REALLY BAD! Saw this ride in game last night. was very suprised. Naturally its a lore /class type look toward the dream ride for warlocks. As a player who is doing his best to play only a paladin I wasnt crazy about this mount in particular lookin up the info ahead of time. Seeing it in game changes that for me though. The mount has a nice glow about it that the screen shots just dont give justice too. If you come by one I highly recomend not selling it. Even if that means you only use it on a warlock bank toon. "i love the lock class mounts" i usually get some frantic whispers. also i have a great transmog for hunters that have this mount. I see a lot of hunters using the bow, but now you can use it in style. theres another shoulder with different colored orbs, i use the green ones for my pvp set and the blue ones for my pve set. This truly is a great mount, i got mine from a pack of cards, so don't despair, they DO actually come out of random packs you buy at stores! Ordered tons of TCG for this mount, hope that I can get it. only to find it the non-loot version of it. As of 5.4 CANNOT BE USED AS A LAND MOUNT. This mount cannot be used as a ground mount or in bgs anymore. I put in a ticket about it and the guy said using it in bgs and as a ground mount was a bug. "The Feldrake having ground mount functionality was originally a bug. When the bug got fixed for all drakes, that functionality got removed. A hotfix is being worked on to add ground mount functionality back in for the Feldrake. " The Feldrake having ground mount functionality was originally a bug. When the bug got fixed for all drakes, that functionality got removed. A hotfix is being worked on to add ground mount functionality back in for the Feldrake. As of Patch 5.4.1, this mount has been fixed and now functions as a ground mount in no-fly zones again. I was lucky enough to steal this mount from a pack and boy am i glad. Saying the card series has ended this mount will be EXTREMELY hard to get, saying you can only get it off of ebay or BMAH. Good luck to all. 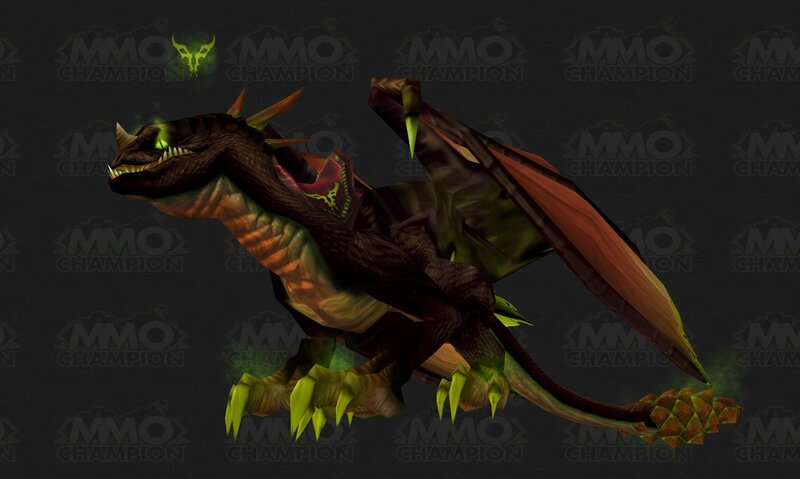 Is it me or does this mount look just like the 10 man normal drake drop from Obsidian Sanctum just without the green? One thing i noticed that it is not mentioned here, is that this mount has a different sound than all other drakes. Its summon sound is identical to the Phoenix mounts, its /mountspecial is the same as other drakes but the sound is different (sorta distorted). All in all, this is an awesome mount and by far the best drake mount in-game. Is there any AH selling this awesome mount in 6.2? In my opinion, this is by far the coolest drake mount in the game. I'd been coveting this mount for a couple of years and now it's mine at last! My husband got it for me via a loot card purchased on Ebay (good thing we're both gamers... xD) and it's my new favorite mount. Really looking forward to using it on a demon hunter come Legion. undermine journal has 22 listed for us available and 0 in EU, whats going on? Have more cards sold to the US? This mount leaves a slight trail behind it, similar to the Netherdrakes or Shadowform, but much subtler. It also has the Demonic Rune floating above its head. The back details are different to the other drakes, in that it looks like a pile of rubble, very similar in colour to the rest of its body. All the other drakes I've seen, have a very clear "tortoise Shell" design. And, as has been said countless times here, this looks great for a Warlock, and from what I've seen of them, it'll suit the Demon Hunters absolutely perfectly. People want 500 to 600 for the fel drake card on amazon lol. I'd rather pay the million on AH. FYI as of 1/29/2018 this loot card is selling for $900 on ebay! Holy crap. The Feldrake now makes a hippogryph sound when mounting up instead of a drake sound, as of 8.0.1. "Fighting the Burning Legion millennia ago, this valiant drake fell to corruption after its body was infused with raw demonic magic." This is a Trading Card Game item, obtained by a rare card in the expansion "Timewalkers: War of the Ancients." To get your item, first you will need to go to WoW's Promotion Page and enter in the 25-digit code on your card. This will then give you an in-game code that can be redeemed by Landro Longshot in Booty Bay.